With its ancient gilded temples, chanting monks and wafting incense, Thailand is considered by many Westerners to be the pinnacle of exotic destinations. There’s no doubt about it, Thailand is rich in culture and history, not to mention friendly people, bustling cities and amazing cuisine. For nature-lovers and eco-tourists, rural Thailand has become a big draw in recent years too, especially for those looking to stray from the beaten path and experience the natural majesty the country has to offer. 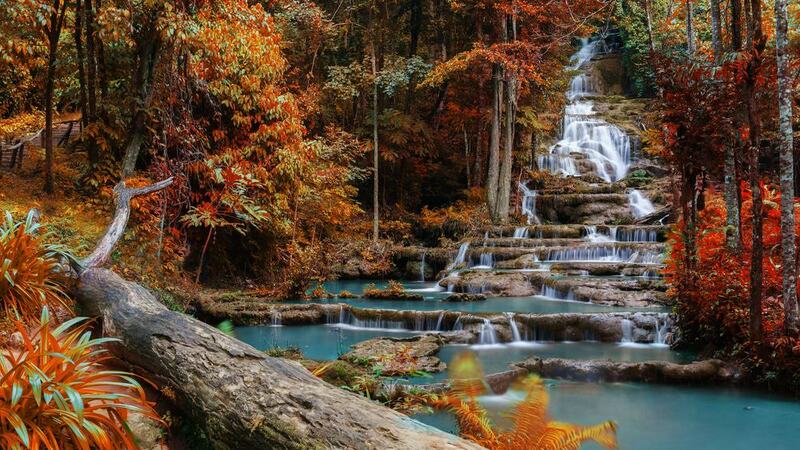 Below is a list of 15 amazing waterfalls in Thailand. 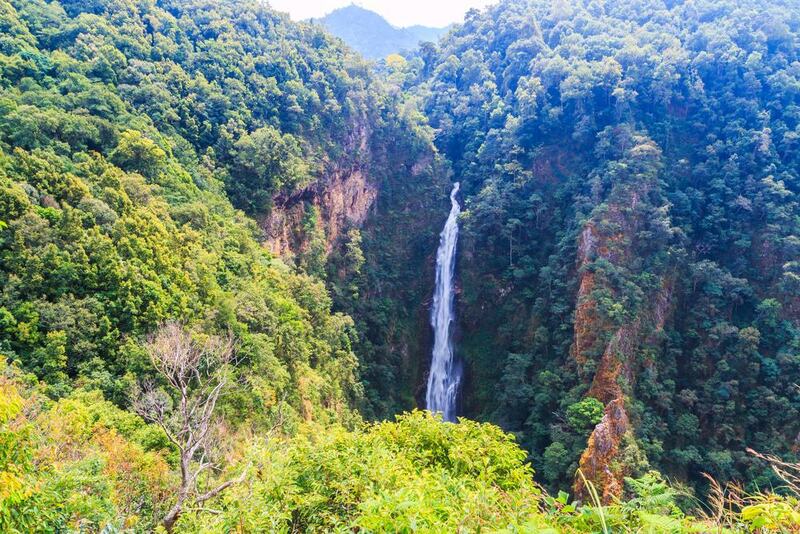 Due to its location in Namtok Mae Surin National Park, the Mae Surin Waterfall is on the radar for locals and international tourists who are drawn to the natural beauty of this region on Thailand’s northwest border. One of the park’s main attractions and most memorable features, the falls flow at a steady stream from the precipice above, nearly 300 feet to the picturesque pool below. 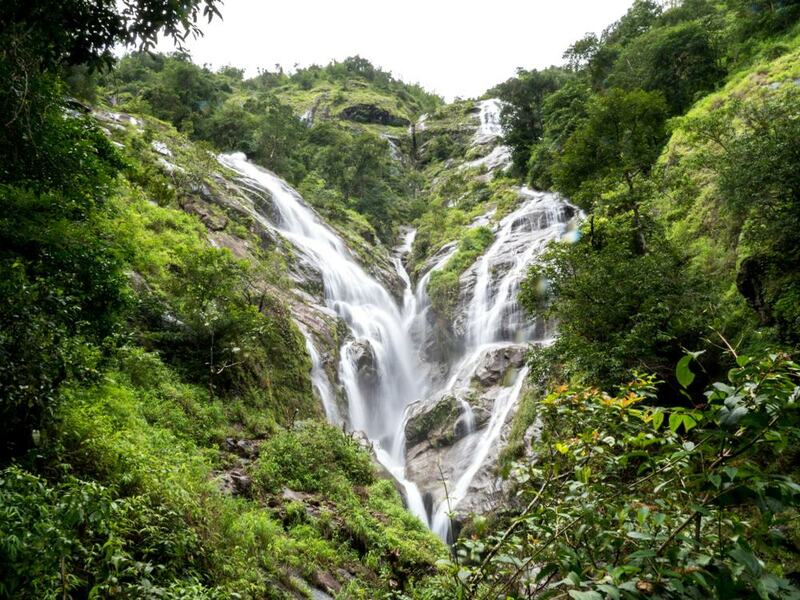 Though there are trails leading to various vista points from where you’ll be able to get up-close glimpses of the falls, they can be slippery and treacherous at times, especially during or after a rain. For those who want to see the falls without risking a fall, there are viewing areas on the trail that’ll give you great views in relative safety. The park is also renowned for its highland birds. If you happen to find yourself on Thailand’s Andaman coast, make room in your itinerary for a trip to the peaceful island of Koh Lanta in Krabi Province. Located on the largest island of the Mu Ko Lanta National Park, the falls are enticingly hidden amidst the area’s stunning forests and geological features, which include cave complexes that are a big draw for spelunkers. The hike to the falls takes about 30 minutes, after which the fall’s cool, clear waters will be a welcome sight. 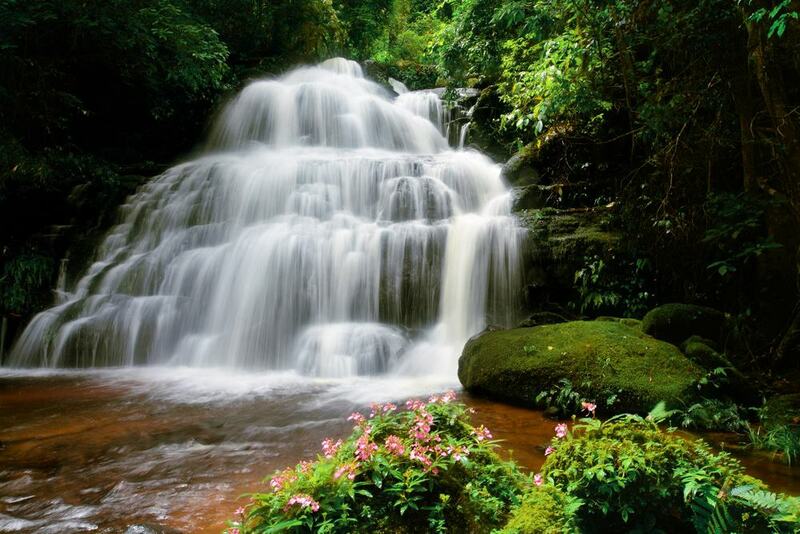 The falls can disappear in the dry season, so it’s best to visit from April to October. 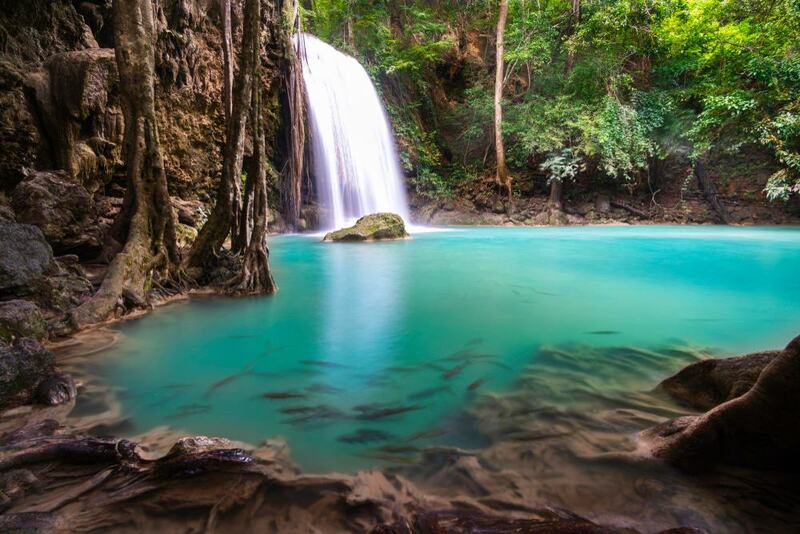 Located about a 3-hour drive west of Bangkok in Kanchanaburi Province, Erawan Falls actually consists of many distinct tiers that come together to create the falls. The first tier of the 3 features pools in which the water is clear enough to see the fish that live in them, so take a snorkel if you’ve got one. The third tier is the largest, with a drop of nearly 100 feet, and if the water flow isn’t too heavy, it’s possible to walk in the space behind the flowing water. The trek to the falls can be challenging and even treacherous depending on conditions, so even though it’s only 1.5 kilometers long, it’s not particularly family-friendly. 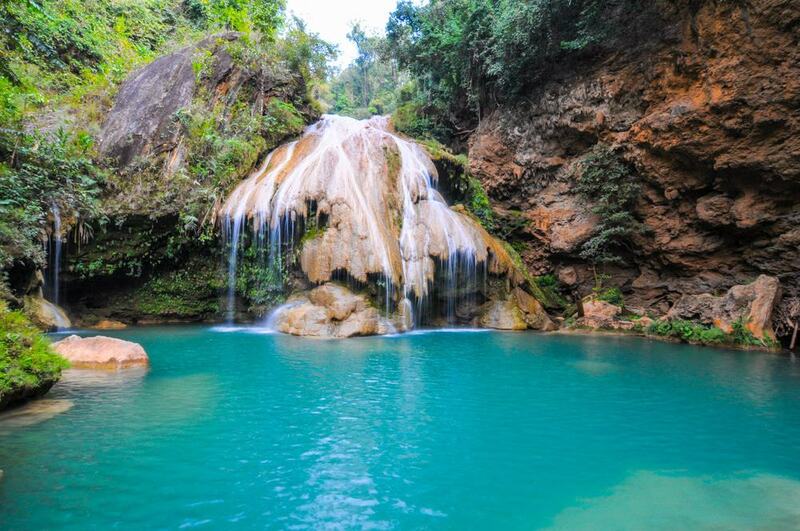 Located in northern Thailand, a relatively short drive from Chiang Mai, is Mae Ya Waterfall. Found in the Doi Inthanon National Park, it’s a great place to escape the city’s hustle and bustle and do some bonding with Mother Nature. The falls are nearly 800 feet tall and 300 wide, and in the rainy season when the flow is at its fullest, they roar and can be heard well before they’re seen. The best way to get to the falls is to hire a car and driver in Chiang Mai, Once in the park, the hike to the falls is only 10 minutes. Size isn’t all that matters, at least when it comes to waterfalls. At about 70 feet from top to bottom, Haew Suwat Waterfall won’t win any awards for the biggest waterfall, but it’s been featured in well-known movies, making it famous in its own right. 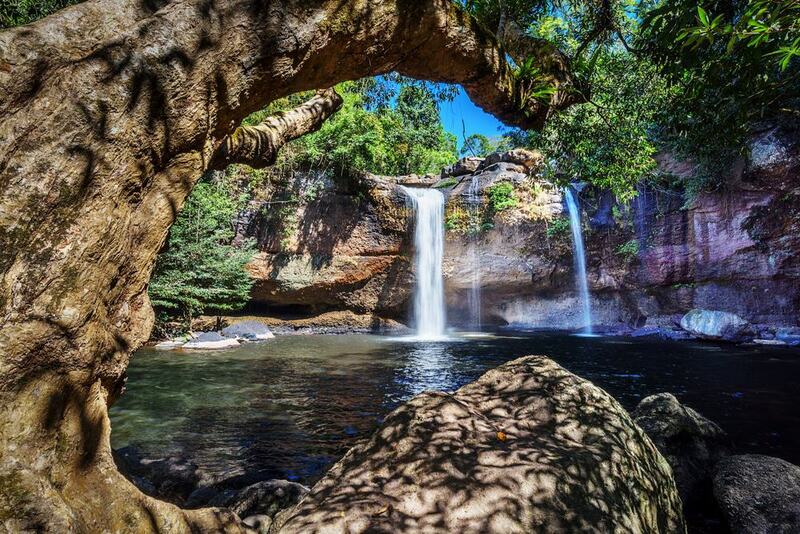 Located in Khao Yai National Park in central Thailand, the park and falls are favorites of locals and tourists who are drawn to its natural beauty and cooling waters. Just a 5-minute walk from the parking area, there are plenty of areas to sit and relax after a swim. For the most stunning and complete view of the falls, there’s a manmade viewing area that’ll give you the best vantage point. 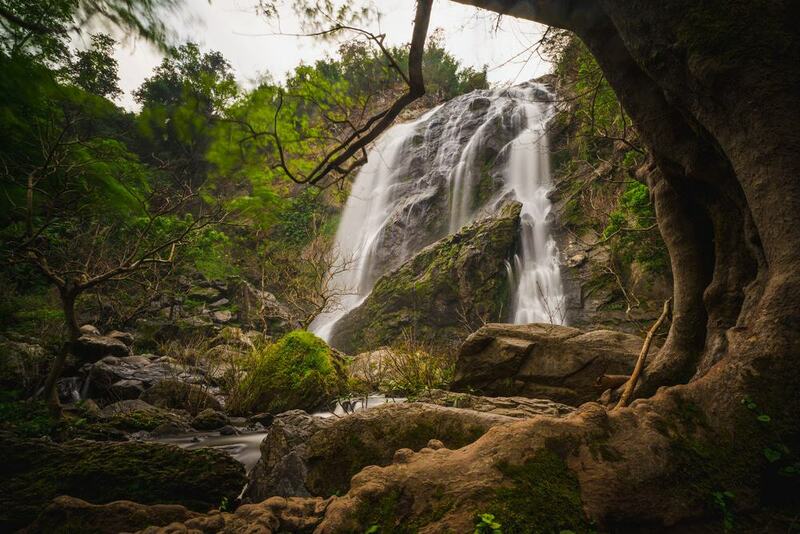 Chock full of natural beauty and waterfalls, Doi Inthanon National Park is home to Pha Dok Siew Waterfall, which literally shoots like a geyser from the dense jungle above. Though not the most accessible of Thailand’s waterfalls, Pha Dok Siew Waterfall’s scenery is memorable, to say the least. The hike in only takes about 20 minutes, but due to its remoteness, most visitors go as part of a tour, many of which include a few cultural stops along the way to see how the locals live. If an amazing waterfall enveloped in a lush forest full of the reddest of red Maple leaves sounds like a place you’d only find on a Canadian vacation, then guess again. 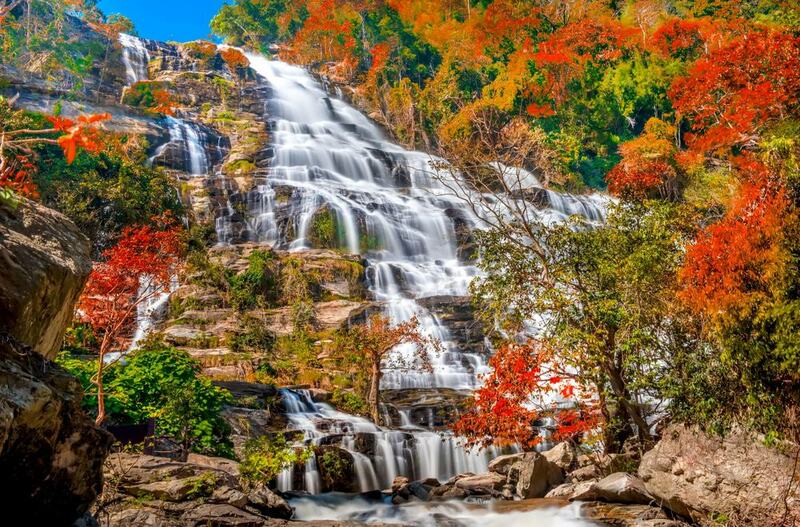 Located in Thailand’s rugged northeast, in the Phu Kradueng National Park in Loei Province, Khun Pong Waterfall is the tallest and most scenic in the park. Since the leaves turn their most vibrant red in the fall, try to schedule your trip to the area at this time of year. Designated as a UNESCO World Heritage Site, Thi Lor Su Waterfall is located inside the Umphang Wildlife Sanctuary in central Thailand. It’s also one of Thailand’s largest waterfalls, not to mention most balanced and photogenic, and it’s comprised of multiple tiers, some of which are nearly 1,000 feet in height. To get to the falls you’ll need to hike in on a relatively well-maintained trail for about 45 minutes. Due to the size, magnificence and relative ease of getting to the falls, they can be downright crowded during peak times. During the rainy season the flow can be extremely powerful too, so be careful. 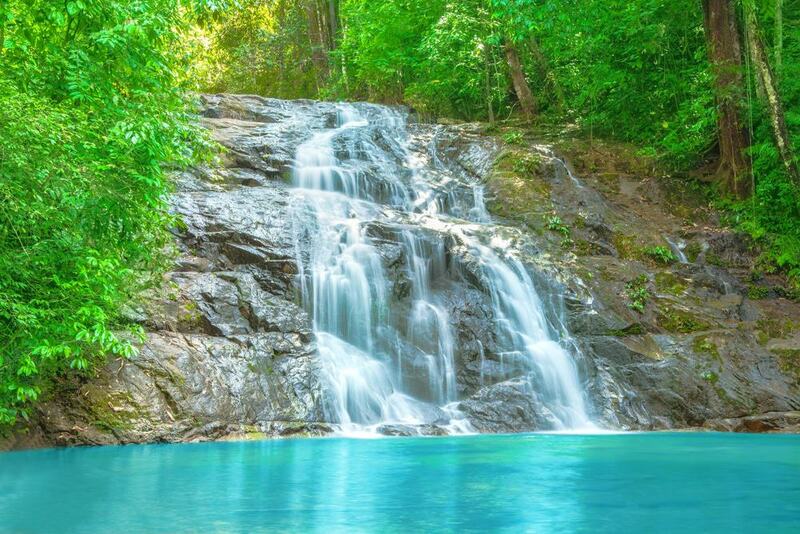 Located on the west coast of Thailand’s narrow peninsula, in the Khao Lak – Lam Ru National Park, and sporting more tiers than your average wedding cake, the Ton Chong Fa Waterfall is also famous for the nifty pools of tiny fish that will gladly nip that dry skin from your body free of charge. Don’t worry, you’ll just feel a tickle. There are multiple swimming and natural sitting areas along the trail that leads to the falls, but bring sturdy shoes, water and a raincoat as the area is remote and rugged. When a waterfall is comprised of nearly 100 individual tiers, it’s something special, and such is the case with Pha Charoen Waterfall in Tak Province in northwest Thailand. 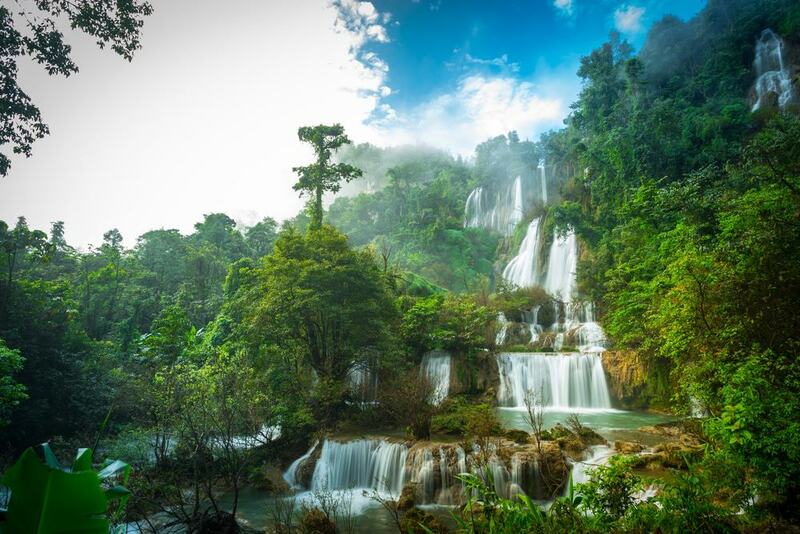 Located in the lush and overgrown forests amid the Thanon Thong Chai Mountains, it’s nearly 200 feet tall and definitely one of the most amazing waterfalls in Thailand. The tiers create an aesthetically pleasing path for the water to cascade down, making the whole area look like the cover of a long-lost copy of National Geographic. The main viewing area is an easy walk from the parking area, but if you’re feeling bold and energetic, there are other, more difficult trails that lead to various elevated vantage points beside the falls. If there’s one thing I’ve always said, it’s that monkeys and waterfalls go together like ham and cheese. If you agree, then a trip to the Gibbon Rehabilitation Project and nearby Bang Pae Waterfalls in Phuket is a must. 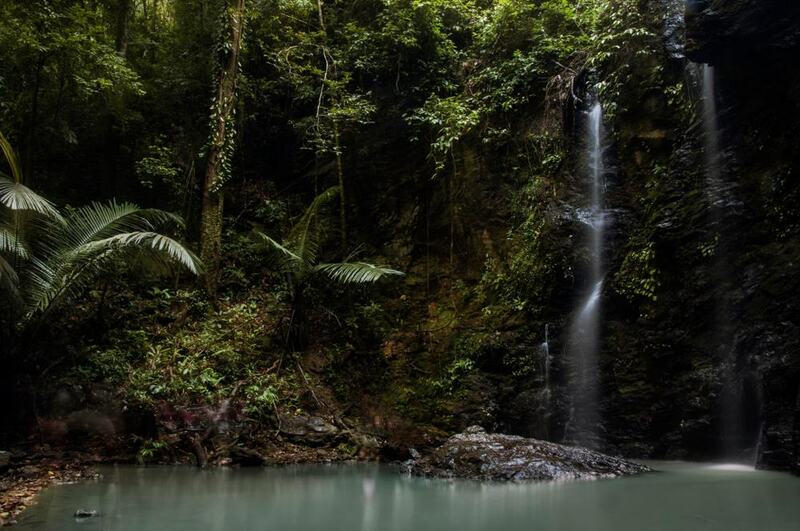 The falls and river are a favorite spot of locals who like to relax, eat and swim in the cooling waters, and though they’re not very dramatic, they’re surrounded by thick jungle that’ll make you feel like you’re your farther away from civilization than you really are. There’s a fee to enter the waterfall area, but the Gibbon Rehabilitation Project area is free. However, they gladly accept donations which help them to continue their good work. Another of Thailand’s amazingly beautiful, multi-tiered waterfalls is the Koh Luang Waterfall found in Mae Ping National Park. The park is set amidst scenic mountains that lie in three different northern Thai provinces, one of which is Chiang Mai. It’s known for its stunning geology, largely undisturbed tracts of natural, highland forest and a famous wat, or temple, of the same name. Though it’s a 3 or 4-hour drive from Chiang Mai, the falls are well worth the trip, as they’re a great place to swim, hike, and appreciate the area’s natural beauty. The park is also a favorite of rock climbers and cave explorers who don’t mind dark, musty subterranean caverns inhabited by bats, giant millipedes and a host of other hair-raising creepy-crawlies. Another of Thailand’s majestic and UNESCO-recognized sites is the Khlong Lan Waterfall and surrounding Khlong Lan National Park. Located in Kamphaeng Phet Province in west-central Thailand, the falls begin humbly as numerous smaller streams merge and create a forceful water flow that descends more than 300 feet from top to bottom. The falls are also broken into a few notable terraces which break the water’s fall mid-flight and create a dramatic, misty view, especially during rainy season when the flow is at its heaviest. 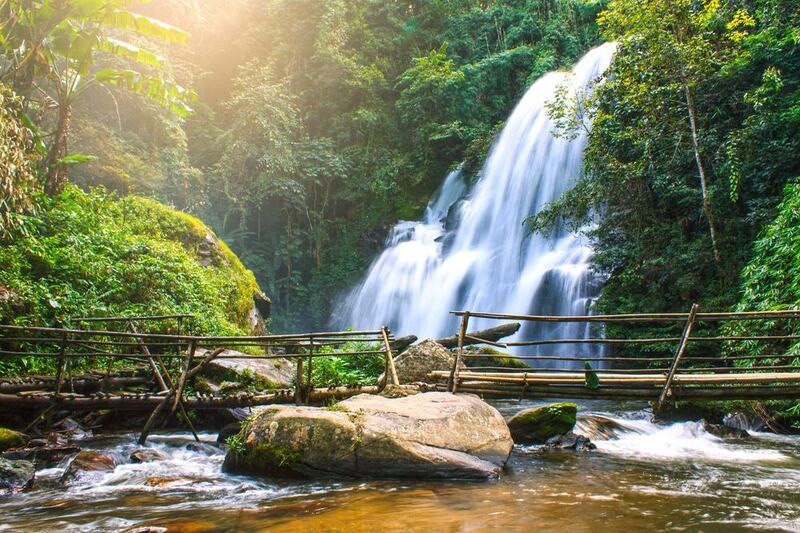 Located inside the Phu Hin Rong Kla National Park near Thailand’s shared northern border with Laos, Man Daeng Waterfall and the surrounding region has a fascinating history. As a communist stronghold during the especially tumultuous ‘70s, the area was made a national park in the ‘80s, and is noted for its highland forests, mountains and remoteness. The falls are a bumpy drive and relatively long 4-kilometer hike from park headquarters, so the only way to see them is with a guide, which you’ll be able to hire at the park office. Your reward for all that planning and exertion will be another multi-faceted fall that is straight out of the Jurassic era. It’s always nice when a natural formation resembles something other than what it is. Visitors approaching the Pi Tu Gro Waterfall in the remote Tak Province usually notice its heart shape that’s formed by two streams of water converging. 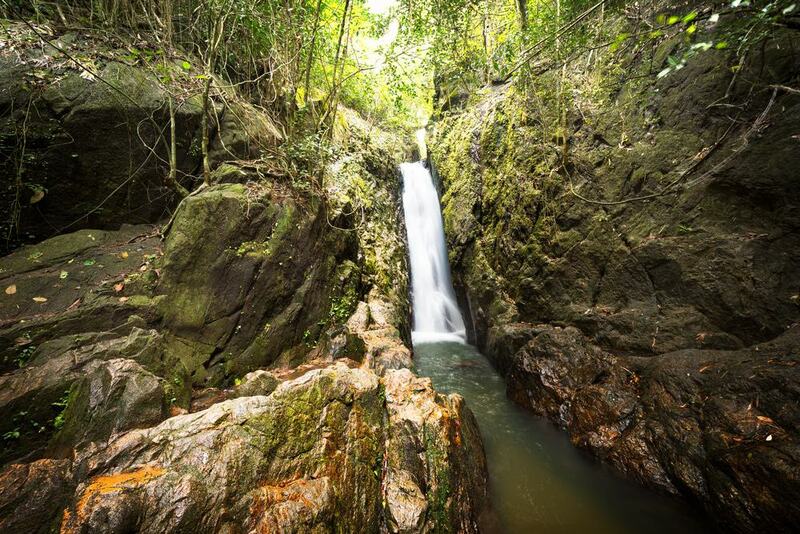 Due to its remoteness, the falls are almost always enjoyed as part of a guided tour which includes other historic and geological sites in the area.